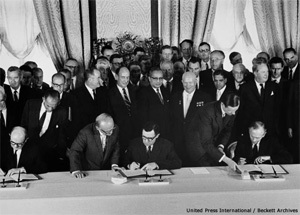 Signing of the Partial Test Ban Treaty, 5 August 1963. Secretary of State Dean Rusk signing for the United States; Foreign Minister Andre Gromyko, signing for the Soviet Union; and Lord Hume signing for the United Kingdom. Photo: CTBTO. Like all first steps, it was long awaited, tentative, and not without risk. Yet, it also held out promise. The Limited Test Ban Treaty (LTBT), the first agreement negotiated to regulate the U.S.-Soviet nuclear competition, was formally signed by the United States, the Soviet Union and the United Kingdom on Aug. 5, 1963 and it entered into force on Oct. 10, 1963. Negotiated only months after the United States and the Soviet Union had walked back from the brink of nuclear war over missiles in Cuba, the treaty offered the hope that Washington and Moscow might be able to rein in the global nuclear arms race, thereby saving the world from an all-consuming nuclear conflagration. The LTBT, which banned nuclear test explosions above ground, underwater, and in space, led to the end of the most visible and strongly opposed aspects of the arms race: hundreds of open-air explosions that spewed dangerous levels of radioactive contamination far beyond the test sites of the nuclear powers. Today, the treaty has 124 states-parties and has established a global norm against atmospheric testing. It outlasted one of its original states-parties, the Soviet Union, and the Cold War that it was conceived to help control. The limits of the treaty are also still apparent. Nuclear testing continued underground for three more decades, and a comprehensive test ban treaty, which still has not entered into force, was not completed until 1996. Nuclear weapons still abound, and the number of countries possessing them has doubled. The specter of nuclear war still haunts the world, although it has receded in the minds of many. During the first half of the 1950s, the United States and the Soviet Union had traded arms control proposals. But these initiatives were primarily designed to score propaganda points rather than serve as any true basis for negotiations. It was in this vein that the Soviet Union first proposed a ban on nuclear weapons testing as part of a May 1955 comprehensive disarmament plan, which included the closure of all foreign military bases—a clear nonstarter from the U.S. perspective given Washington’s European commitments, particularly in divided Germany. President Dwight Eisenhower endorsed the idea of a nuclear test ban in 1957, moved by his own qualms about the burgeoning and costly arms race with the Soviet Union and mounting public concerns, both globally and in the United States, about the adverse health effects of nuclear weapons testing. His condition that the ban be facilitated by a halt to the production of nuclear weapons-usable material and international inspections guaranteed the proposal’s rejection by the Kremlin, which was deeply suspicious of inspections being used for U.S. or Western espionage. Eisenhower, as well as his successor Kennedy, faced not only Soviet objections but also domestic opposition from nuclear weapons scientists and military leaders, who feared that the Soviet Union would cheat on any agreement to gain superiority over the United States. Robert McNamara, who served as Kennedy’s secretary of defense, recalled in a Sept. 25 interview, that one of the more outlandish arguments advanced by the military was that the Soviets would be able to cheat by testing nuclear weapons behind the moon. Seeking to calm the military’s concerns, Eisenhower convened an international conference of experts in 1958 to assess how and whether cheaters could be caught. The experts, who met for two months that summer, concluded that a comprehensive test ban could be verified using a network of international monitoring stations. They also recommended establishment of an international organization that could conduct inspections if needed. Bolstered by the experts’ findings and goaded by a March 31 Soviet declaration that it would halt nuclear testing if nobody else tested as well, Eisenhower announced in August 1958 Washington’s readiness to negotiate a nuclear test ban and suspend nuclear testing for a year beginning Oct. 31. The Soviets accepted, negotiations began, and the United States, the United Kingdom, and the Soviet Union would not conduct a full-scale nuclear test explosion for nearly three years. France, however, would carry out its first-ever test in February 1960. Negotiations quickly hung up on the subject of verification, with the United States doggedly pushing for inspection mechanisms against stiff Soviet resistance. Moscow held that a treaty should be negotiated first, then a verification regime. The talks limped along until they finally collapsed for the remainder of Eisenhower’s presidency in the wake of the Soviet Union’s May 1960, shootdown of a U.S. U-2 reconnaissance plane over Russia. With the new Kennedy administration in office, test ban talks resumed in the spring of 1961. Yet, they soon stalled again on the subject of inspections. Trying a different tack, Kennedy and British Prime Minister Harold Macmillan proposed in September 1961 the negotiation of a ban on nuclear testing in the atmosphere, which would not require inspections to detect cheating. Having just resumed atmospheric testing that month, Moscow rejected the idea, saying it would settle for nothing less than a comprehensive ban. Pressured by lawmakers and the military to respond to the Soviet testing, Kennedy authorized a resumption of U.S. underground nuclear testing that same month and atmospheric testing beginning in April 1962. The four nuclear powers conducted a record 178 nuclear tests in 1962. Following the Cuban missile crisis of October 1962 and amid continuing public outcries against the hazardous effects of atmospheric testing, both superpowers were eager to ease tensions and dampen public fears about nuclear weapons. Soviet Premier Nikita Khrushchev seized the initiative in a Dec. 19, 1962, letter informing Kennedy that the Soviet Union would abandon its absolute opposition to inspections for a nuclear test ban. The two sides, however, continued to wrangle over the precise number of acceptable inspections. Moscow said it would only permit a maximum of two or three, but the United States wanted more. Little headway was made until Khrushchev accepted an April 1963 U.S.-British proposal to send high-level experts to Moscow to discuss the test ban. In a passionate June 10, 1963, speech announcing the Moscow meeting, Kennedy sought to spur the negotiations. Describing the forthcoming talks as embodying the “hopes of all mankind,” the president urged the completion of a treaty and pledged that the United States would halt atmospheric testing as long as no other countries conducted such tests. Khrushchev offered a surprising response July 2. Although reversing himself on permitting inspections, he also changed the Soviet position solely insisting on a comprehensive test ban. A limited ban on nuclear tests in the atmosphere, under water, and in outer space was feasible, Khrushchev said, because it would avoid the vexing issue of inspections. Any hopes Harriman may have had of negotiating a comprehensive ban quickly dissipated soon after his arrival in Moscow. In the delegation’s first meeting with Khrushchev July 15, the Soviet premier ruled out even a single inspection on the grounds that it would facilitate spying. Khrushchev compared U.S. assurances to the contrary as a cat saying it would eat the mice but not the bacon in a room. Another sign to the U.S. delegation that a comprehensive ban was out of the question was the absence of Soviet geophysicists in Moscow at the time. Carl Kaysen, a member of the U.S. delegation, said in a Sept. 24 interview that the Americans tried reaching geophysicists they knew after arriving in Moscow but none of their calls were answered. The geophysicists were the experts familiar with underground nuclear testing. With the prospect of a comprehensive ban dead, the negotiators settled to work on an agreement barring tests in the three spheres outlined by Khrushchev earlier in the month. They got one in 10 days. Kennedy’s salesmanship was not gratuitous. He thought it absolutely necessary to build strong public support for the treaty to get the Senate to approve it. Kennedy’s lobbying and the grudging endorsement of the U.S. Joint Chiefs of Staff (JCS) paid off with a positive 80-19 vote Sept. 24, 1963. Despite intermittent French and Chinese above ground tests until 1974 and 1980, respectively, the treaty accomplished what it was primarily designed to do: significantly reduce atmospheric fallout. This treaty success, however, also unexpectedly tempered public pressure and governmental action toward a comprehensive test ban and other arms control agreements by eliminating the most offensive and visible aspect of the U.S.-Soviet arms race. As a partial testing ban, the treaty also did not impede U.S. or Russian nuclear weapons development and testing but merely drove it underground. This was the price that Kennedy had paid for the JCS support of the treaty. He had won military support for the treaty with the promise of comprehensive and aggressive underground testing, as well as increased funds for the weapons laboratories. Despite Kennedy’s hope that the treaty could help curb the emergence of new nuclear powers, China acceded to the nuclear ranks in October 1964. India, Israel, and Pakistan have also since joined the nuclear club, and North Korea is on the threshold. Although the treaty’s practical accomplishments fell short of Kennedy’s lofty goals, its symbolism as the first step in the two superpowers’ efforts to constrain their competition was welcome comfort to a world emerging from the fearful days of the Cuban missile crisis. It also served as a precedent for future nonproliferation and disarmament treaties and an example of bitter adversaries overcoming differences to pursue common interests. Few first steps realize dramatic results. Additional steps are needed to finish the quest for a permanent, comprehensive test ban on nuclear weapons testing. This entry was posted in CTBT, Europe, Non-proliferation, Nuclear Weapons, Russia and tagged Cuban Missile Crisis, John F. Kennedy, Limited Test Ban Treaty, Nikita Khrushchev. Bookmark the permalink.